This article is about the Feast of the Ascension. For the feast six weeks earlier during Holy Week, also known as Holy Thursday, see Maundy Thursday. 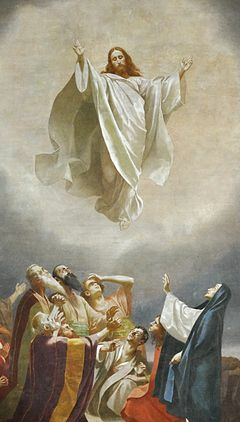 The Feast of the Ascension of Jesus Christ, also called Ascension Day, Ascension Thursday, or sometimes Holy Thursday, commemorates the Christian belief of the bodily Ascension of Jesus into heaven. It is one of the ecumenical (i.e., universally celebrated) feasts of Christian churches, ranking with the feasts of the Passion, of Easter, and Pentecost. Ascension Day is traditionally celebrated on a Thursday, the fortieth day of Easter (following the accounts given in Mark 16:19, Luke 24:51 and Acts 1:2), although some Christian denominations have moved the observance to the following Sunday. The observance of this feast is of great antiquity. Eusebius seems to hint at the celebration of it in the 4th century. At the beginning of the 5th century, St. Augustine says that it is of Apostolic origin, and he speaks of it in a way that shows it was the universal observance of the Church long before his time. Frequent mention of it is made in the writings of St. John Chrysostom, St. Gregory of Nyssa, and in the Constitution of the Apostles. The Pilgrimage of Aetheria speaks of the vigil of this feast and of the feast itself, as they were kept in the church built over the grotto in Bethlehem in which Christ is traditionally regarded as having been born. It may be that prior to the 5th century the event narrated in the Gospels was commemorated in conjunction with the feast of Easter or Pentecost. Some believe that the much-disputed forty-third decree of the Synod of Elvira (c. 300) condemning the practice of observing a feast on the fortieth day after Easter and neglecting to keep Pentecost on the fiftieth day, implies that the proper usage of the time was to commemorate the Ascension along with Pentecost. Representations of the mystery are found in diptychs and frescoes dating as early as the 5th century. The Latin terms used for the feast, ascensio and, occasionally, ascensa, signify that Christ was raised up by his own powers, and it is from these terms that the holy day gets its name. In the Book of Common Prayer of the Anglican Communion, "Holy Thursday" is listed as another name for Ascension Day. William Blake's poem "Holy Thursday" refers to Ascension Day; Thomas Pruen used the term to refer to Ascension Day in his Illustration of the Liturgy of the Church of England, published in 1820; however use of the term "Holy Thursday" to mean Ascension Day is rare, and the term is more generally applied by most Christian denominations to Maundy Thursday in Holy Week. In Western Christianity, the earliest possible date is April 30 (as in 1818 and 2285), the latest possible date is June 3 (as in 1943 and 2038). In Roman Catholicism, the Ascension of the Lord is a Holy Day of Obligation and in the Anglican Communion, Ascension Day is a Principal Feast. The three days before Ascension Thursday are sometimes referred to as the Rogation days, and the previous Sunday — the Sixth Sunday of Easter (or the Fifth Sunday after Easter) — as Rogation Sunday. Ascension has a vigil and, since the 15th century, an octave, which is set apart for a novena of preparation for Pentecost. Almighty God, whose blessed Son our Saviour Jesus Christ ascended far above all heavens, that he might fill all things: Mercifully give us faith to perceive that according to his promise he abideth with his Church on earth, even unto the end of the world; through the same thy Son Jesus Christ our Lord. Amen. The Roman Catholic Church in a number of countries that do not observe the feast as a public holiday has obtained permission from the Vatican to move observance of the Feast of the Ascension from the traditional Thursday to the following Sunday, the Sunday before Pentecost. Similarly, The United Methodist Church allows the traditional celebration on Holy Thursday to be moved to Sunday. This is in keeping with a trend to move Holy Days of Obligation from weekdays to Sunday, to encourage more Christians to observe feasts considered important. The decision to move a feast is made by the bishops of an ecclesiastical province, i.e. an archbishop and the neighbouring bishops. The switch to Sunday was made in 1992 by the church in Australia; before 1996 in parts of Europe; in 1997 in Ireland; before 1998 in Canada and parts of the western United States; in many other parts in the United States from 1999; and in England and Wales from 2007-2017, but in 2018 reinstated to Thursday. The U.S. ecclesiastical provinces which retain Thursday observance in 2009 are Boston, Hartford, New York, Newark, Omaha, and Philadelphia. When celebrated on Sunday, the earliest possible date is May 3, and the latest is June 6. In the Eastern Church this feast is known in Greek as Analepsis, the "taking up", and also as the Episozomene, the "salvation from on high", denoting that by ascending into his glory Christ completed the work of our redemption. Ascension is one of the Twelve Great Feasts of the Orthodox liturgical year. The feast is always observed with an All-night vigil. The day before is the Apodosis (leave-taking) of Easter (i.e., the last day of the Feast of Easter). Before the Vigil, the Paschal hours are said for the last time and the Paschal greeting is exchanged. I am with you and no one will be against you. Who has ascended from earth to heaven! gave birth in time to the Timeless One. At the Divine Liturgy, special antiphons are sung in place of Psalms 102 and 145 and the Beatitudes. The Epistle is Acts 1:1–12, and the Gospel is Luke 24:36–53. Ascension Thursday also commemorates the Holy Georgian Martyrs of Persia (17th–18th centuries). Ascension has an Afterfeast of eight days. The Sunday after Ascension is the Sunday of the Holy Fathers of the First Ecumenical Council at Nicaea. This council formulated the Nicene Creed up to the words, "He (Jesus) ascended into heaven, and sits at the right hand of the Father; and shall come again, with glory, to judge the living and the dead; Whose kingdom shall have no end." The Afterfeast ends on the following Friday, the Friday before Pentecost. The next day is appropriately a Saturday of the Dead (general commemoration of all faithful departed). The Eastern Orthodox Church uses a different method of calculating the date of Easter, so the Eastern Orthodox commemoration of Ascension will usually be after the western observance (either one week, or four weeks, or five weeks later; but occasionally on the same day). The earliest possible date for the feast is May 13 (of the western calendar), and the latest possible date is June 16. Some of the Oriental Orthodox Churches, however, observe Ascension on the same date as the Western Churches. The feast has been associated with specific hymns and other church music. The oldest hymn in German related to the feast is the Leise "Christ fuhr gen Himmel", first published in 1480. Johann Sebastian Bach composed several cantatas and the Ascension Oratorio to be performed in church services on the feast day. He first performed Wer da gläubet und getauft wird, BWV 37, on 18 May 1724, Auf Christi Himmelfahrt allein, BWV 128, on 10 May 1725, Gott fähret auf mit Jauchzen, BWV 43, on 30 May 1726 and the oratorio, Lobet Gott in seinen Reichen, BWV 11, on 19 May 1735. ^ a b Thomas Ignatius M. Forster (1828). Circle of the Seasons, and Perpetual key to the Calendar and Almanack. Oxford University Press. Retrieved 1 April 2012. Holy Thursday or Ascension Day. Festum Ascensionis. Le Jeudi Saint d' Ascension. ^ a b George Soane (1847). New Curiosities of Literature and Book of the Months. Churton. Retrieved 1 April 2012. Ascension Day, or Holy Thursday. This, as the name sufficiently implies, is the anniversary of Christ's Ascension. ^ Louis Duchesne, Christian Worship: Its Origin and Evolution (London, 1903), 491–515. ^ Church of England, "A Table of the Vigils, Fasts and Days of Abstinence to be observed in the year"
^ Keene, Michael (2000). Christian Life. Nelson Thornes. p. 60. ISBN 9780748752874. The day is sometimes called Holy Thursday. ^ Collins English Dictionary: Definition of "Holy Thursday"
^ "Rules to Order the Christian Year". Church of England. 2015. Retrieved 14 May 2015. Rogation Days are the three days before Ascension Day, when prayer is offered for God's blessing on the fruits of the earth and on human labour. The nine days after Ascension Day until Pentecost are days of prayer and preparation to celebrate the outpouring of the Spirit. ^ a b The Book of Worship for Church and Home: With Orders of Worship, Services for the Administration of the Sacraments and Other Aids to Worship According to the Usages of the Methodist Church. Methodist Publishing House. 1964. p. 122. Retrieved 25 March 2017. ^ Hickman, Hoyt L. (1 July 2011). United Methodist Altars. Abingdon Press. p. 52. ISBN 9781426730696. ^ a b c Ascension Day is Moving Michael Kwatera, OSB. Office of Worship, Diocese of Saint Cloud. ^ "Column 8". Sydney Morning Herald. 14 May 1992. p. 1. ^ "Church holy day changes sought". The Irish Times. 10 October 1996. p. 5. Retrieved 2009-06-11. ^ Pollak, Andy (17 October 1996). "Holy days moved to following Sunday". The Irish Times. p. 7. Retrieved 2009-06-11. ^ "The Church in Malankara switched entirely to the Gregorian calendar in 1953, following Encyclical No. 620 from Patriarch Mor Ignatius Aphrem I, dt. December 1952." Calendars of the Syriac Orthodox Church. Retrieved 22 April 2009. This page was last edited on 5 April 2019, at 10:02 (UTC).